I’ve created this faq to address issues raised by GiffGaff customers. They will not allow me to refer to individual pages on this site within my posts and that has made it difficult to provide help for specific issues. The faq deals with many of the common questions, but is a work in progress. Suggestions for modification or improvement will be gratefully received! I’m receiving ‘Payforit’ charges, or I’m being charged for Premium Texts. I know who is responsible for the charges. What should I do? I’m receiving ‘Payforit’ charges, but I am unable to tell who is responsible for the charges, What should I do? I have received ‘Payforit’ charges. I didn’t subscribe to anything. How did this happen? Can I block ‘Payforit’ charges and/or Reverse Premium Texts? My GiffGaff balance is lower than it should be. How can I check why? Can a GiffGaff agent help me resolve a ‘Payforit’ issue? Can GiffGaff block ‘Payforit’ charges and/or Reverse Premium Texts from my account? I don’t believe that GiffGaff pass my number to third parties. Can you show that this happens? I’ve sent a STOP text to stop a subscription, how do I get a refund? Why won’t GiffGaff help me recover my money, surely they took it? The company that took my money has refused to refund. Is there anything else I can do? What is this ‘Payforit’ company? How is ‘Payforit’ supposed to work, and why is it so vulnerable to fraud. I’ve been told that the Phone-paid Services Authority might be able to help. Who are they and what do they do? What is the difference between ‘Payforit’ and Reverse Premium Charge texts. I’ve been caught out by a ‘Payforit’ scam. Should I change my number? Is it true that GiffGaff profit from these scams? I’m unhappy that GiffGaff allowed this to happen. Is it worth moving to another network? I’ve sent a STOP text, but I’m still being charged. What can I do? This is a problem which frequently occurs. Either a weekly amount (usually £3 or £4.50) is taken from your account with no explanation. It’s a good firstly to check your most recent transactions. Check your GiffGaff usage statement. The usage statement will probably show one or more premium texts at weekly intervals. Assuming that this is the case, these will be ‘Payforit’ charges. You now need to try to find out what service you are subscribed to. The first thing to check is that you are not barring the receipt of premium rate texts. There is little point in barring the receipt of these texts, as you are charged for them whether you receive them or not! If you have barred a number, thinking that the ‘Payforit’ texts were a scam, it’s worth sending a STOP ALL message to the number in question. Also check to see if you’ve placed a 5 digit number on your blocked /spam /reject list. If you have, unblock it and text the words STOP ALL to it. If your ‘Payforit’ receipt came from an 8 digit number, it can be worth putting that number in to the PSA number checker. It may give details of a ‘Level 1 provider’ such as Tap2Bill. If you have contact details for the level 1 provider you can try calling them to see whether they can identify the ‘Level 2’ company responsible for the charge. If all else fails, you will need to raise the issue with GiffGaff. The regulator expects networks to render this minimal level of assistance, so if they are unhelpful, raise it as a formal complaint. Once you have identified the source of the charges and sent a STOP ALL text, you can pursue a refund. Put the 5 digit umber in to the number checker on the PSA website: PSA Website. Here you should find the phone number for the company which has taken your money. If the number checker doesn’t provide the details, call PSA on 0300 30 300 20 (Monday – Friday, 9.30am – 5pm, excluding bank holidays) and ask them to help. You need to be aware that while you are connected to the internet via mobile data, your number may be passed by GiffGaff to third parties for charging purposes. The mechanism by which this happens is called ‘Payforit’. This can’t happen while you are connected by WiFi. Once the third party has your number they can make ‘Payforit’ charges to your account and, very unfairly in my opinion, it will be your job to argue for a refund! I’m not going to insult the reader’s intelligence by saying that you must have ‘inadvertently’ subscribed. This probably happens occasionally, but if the rules are being followed it should be very obvious if you are signing up to one of these services. More likely you’ve been signed up by a malicious script in a web page, or by malware on your phone. Whatever these companies may say, if you didn’t knowingly consent to these charges they are llegal and you are entitled to a refund. So if you are receiving unauthorised ‘Payforit’ charges you will need to take action yourself. You are strongly advised not to use settings on your phone to block these texts. you may well succeed in blocking the texts, but will not block the charges. There is nothing worse than being charged for a text you cannot see! You can check your usage statement here: Check your GiffGaff usage statement. Remember that this page is only updated daily (at about 8:00am, so any charges from the current day will not show. Payforit charges show as premium texts, usually for £3.00 or £4.50, although other amounts are possible. The current rules mean that the charge is unlikely to exceed £4.50 per week. If you find these charges on your usage statement, but are unable to identify the texts they refer to, follow the advice here. In general, the answer to this is no. If you are having trouble identifying the ‘service’ which is taking your money, they are supposed to help you with identifying who has taken your money. That is the only help they are currently required to give. It is up to you to stop the charges and get a refund. Many consumers find this difficult to understand. I often hear ‘GiffGaff gave them my money, surely they should help me get it back’. I sympathise and agree that this should be the situation, but it isn’t, so you need to deal with it yourself. This has been a cause of much confusion in the past. GiffGaff do offer a ‘Premium Rate Bar’, however its effect appears to be very limited. In particular it will not stop reverse premium rate texts or ‘Payforit’ charges. Interestingly, GiffGaff’s parent network, O2,do offer a ‘charge to bill’ bar which is effective against ‘Payforit; charges. As GiffGaff is a Pay As You Go network, any charges are taken from the airtime balance. If you have no airtime balance (and auto-top up is disabled), Payforit charges cannot be taken. However, when you top up again, any pending charges will be applied, so this is not a good way of dealing with the problem. The situation as regards blocking ‘Payforit’ charges on other networks is discussed here. Here’s a test you can try. As an example browse to jamster.co.uk using a WiFi connection. Go to html5 games and click on Flappy Bird.. Click the red button and you will get this screen. Note that it asks you for your phone number. This is because the company have no way of knowing your phone number. They can’t get it from your phone as your web browser won’t have permissions to this information. Now use a mobile data connection (3G or 4G) and repeat the process. Note that in this case it gives you the opportunity to subscribe WITHOUT asking for your phone number. This is because your phone number has been supplied by GiffGaff via ‘Payforit’. All this is perfectly normal expected behaviour and is not indicative of a scam. It’s just that many consumers don’t realise that their phone number can be passed in this way. 1. You type it in and deliberately give it to them. 2. Your network provider passes it to them. 3. They obtain it from some other third party as a result of you having supplied it quite legitimately for contact purposes. The problem is that GiffGaff have no way of knowing whether a charge is legitimate and make no checks. It’s rather like having someone walk in to your bank, knowing your account number, and saying they have your authority to take out money from your account. The bank would insist on proof, but GiffGaff just pay out the money. Of course, your phone number is far less secure than your bank account number as you need to give it to people to be able to contact you. You should approach the company that took your money for a refund. Tell them that you never knowingly subscribed, and that you never used the service they provided. Further advice on this process is here. Often these companies will refund without too much difficulty, particularly if the amount involved is small. When the amount involved is larger (because the ‘subscription’ was not spotted at an early stage) they can be more difficult. There is advice on how to deal with this situation here. The most important thing is to be persistent. You will find many success stories on the pages of this site. You would think they would wouldn’t you? I’m afraid all the networks, including GiffGaff refuse to intervene in disputes between their customers and ‘Payforit’ scammers. So you really do have to do it yourself. It isn’t fair and it isn’t moral, but that’s how it is! There is no formal disputes /refunds mechanism for ‘Payforit’. Ultimately, for companies based in the UK or in the EU, the best approach is to use the small claims court. Be calm and be fair. Send a ‘Letter before Action’ to the company giving them a reasonable period to refund. If they fail to do so, take action through Moneyclaim Online. This will cost about £25 which will be added to your claim. Most companies pay up when faced with a Letter before Action. They all pay up when faced with the court documents. To my knowledge no case has ever got to the point of being decided by a court, and there has been a 100% success rate in achieving a full refund together with court fees. Companies often claim to have ‘proof’ that you ‘consented’ to the charges. This is nonsense, all they have is a weblog which shows that certain links were clicked on your phone. There is plenty of evidence that this can happen as a result of malicious code in webpages, or malware on a users phone. It is not evidence of consent. It is also worth asking the company whether they have any evidence that you actually used the service you paid for. Full information, including a sample Letter before Action is here. Payforit is not a company, but the name given to a payment mechanism designed and operated by O2, Vodafone, Three and EE. Although there is a Payforit website, you will find there is no method of contact, because they don’t really exist. So when networks blame ‘Payforit’ they are really blaming themselves! As an MVNO, GiffGaff are not directly involved in design and management of Payforit, but are consulted by the big four networks. As such they are less culpable than the other networks for the vulnerability of ‘Payforit’. 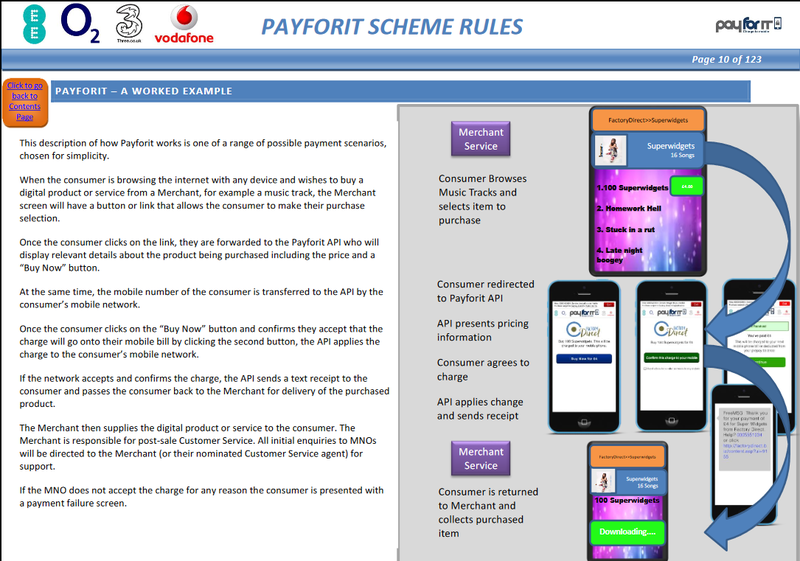 Payforit is a mechanism designed to allow the purchase of goods or services to be charged directly to your phone bill. With PAYG providers like GiffGaff, the charges are taken from your airtime balance. Goodybag contents cannot be affected. When you browse the internet using mobile data, the payforit mechanism allows your phone number to be supplied directly to third parties and used for charging purposes. The rules governing this are quite strict and intended to prevent fraud. The chief vulnerability is that the consumer’s phone number is passed to the ‘third party’ just by clicking a couple of links. Malicious software can disguise these clicks, or even emulate them, and it is apparent that this is why so many consumers are receiving unexpected ‘Payforit’ deductions. The Phone-paid Services Authority(PSA) regulates the industry and will soon be consulting on changes to the rules governing ‘Payforit’ subscription services. We hope to see the introduction of a two step authorisation process, where a PIN number has to be entered by the consumer to complete a ‘Payforit’ transaction. EE introduced this in February and it has been successful in dramatically reducing ‘Payforit’ fraud on that network. The Phone-paid Services Authority(PSA) is the regulator for Premium Rate Services, including ‘Payforit’. It is important to understand their role. They are not an ombudsman. They will not intervene in individual disputes between consumers and companies. Sometimes networks will tell you to ‘escalate’ your complaint to PSA, or say ‘PSA will sort it out for you’. This is misleading. PSA will advise, but will not intervene. Sometimes, after months of investigation, PSA will order refunds after an investigation of a company, but this a byproduct of their investigation. If you want your money back quickly you need to take action yourself. Despite this, ‘Payforit’ scams should be reported to the PSA. If enough complaints are received, the PSA will investgate. The PSA publish a Code of Practice, with which all operators are expected to comply. Among other requirements the Code insists that operators should have consent before charging. The PSA is funded by the industry it regulates, and that is a serious problem. Take a look at their Facebook reviews. They are not a great advertisement for self regulation. If you’ve been scammed, please report the matter to PSA. Make sure they give you a case number, which means that your case will be recorded in the official figures. These figures are important in highlighting the scale of Payforit fraud. Complaining to the Phone-paid Services Authority. More information about the Phone-paid Services Authority. Reverse Premium Charge texts used to be the method of choice for scammers, as none of the networks seems to be able to stop them. A couple of years ago it became mandatory for subscription services to charge via ‘Payforit’, as this was supposed to be more secure. The scammers have now turned their attention to ‘Payforit’ as will be seen from the following graph from the Phone-paid Services Authority. 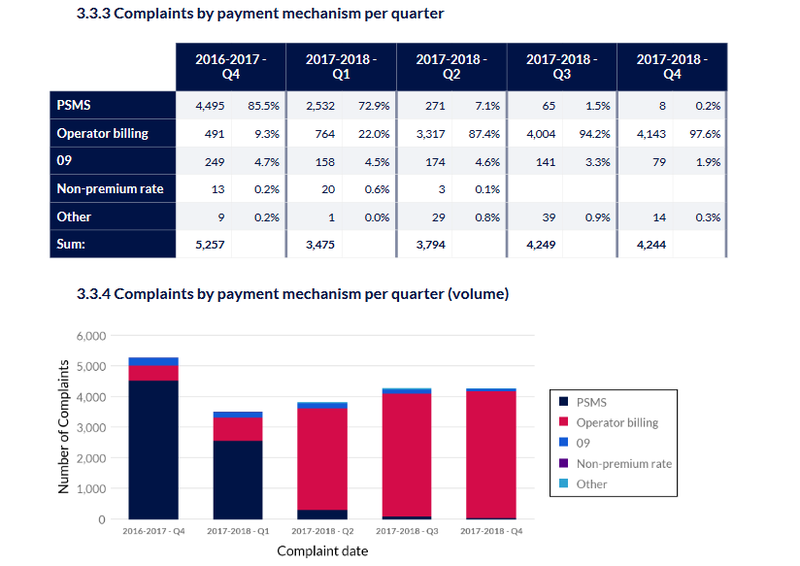 Note that since the end of 2016, Premium Text (PSMS) complaints have all but disappeared whilst Operator billing (Payforit) complaints have seen a massive rise. Payforit is now the scammers weapon of choice. PSMS can still be used for some purposes, but not for subscription services. Some people may advise you to change your phone number after receiving scam ‘Payforit’ charges. If you have successfully stopped the charges this is unnecessary. Your new number is no less likely to be affected by another scam than your old number. Unfortunately, if you are determined to have no dealings with the company that scammed you, this may be only way of stopping the charges. However I have never heard of anyone being unable to stop the charges, either by sending the STOP text or by calling the service’s helpline. In summary I wouldn’t recommend changing your number. For most people this would be very inconvenient and it doesn’t reduce the risk of another scam. The networks including GiffGaff are normally reluctant to make any comment concerning this. No comment is most certainly not the same thing as a denial. However, in 2016, Vodafone broke ranks and admitted that it received ‘a small margin’. I find it rather unlikely that Vodafone are alone in making a profit from these scams. When similar ‘charge to bill’ arrangements have been subjected to scrutiny elsewhere it has been shown that the networks have profited from them. GiffGaff will incur costs in handling these charges and dealing with queries related to them. They are not a charity, and I would at least expect them to be covering their costs. Subsidising these scams would, I think, be a even worse accusation than profiting from them! I remain of the view that it is overwhelmingly probable that all of the networks, including GiffGaff, profit from ‘Payforit’. They are not charities after all. The networks approach to ‘Payforit’ scams varies. Let’s start by making it clear that moving to another network will not stop any existing charges. The charges relate to your number and will follow you if you move. O2, EE and Vodafone all offer a ‘charge to bill’ bar which will stop ‘Payforit’ charges. Three and GiffGaff do not. If you have up to date information about other networks please get in touch. EE have also implemented a requirement for a two stage authorisation with PIN for all subscription services. So far this seems to have virtually eliminated Payforit scams from the EE network. So, as things stand today (30th July 2018), I would have to recommend EE as having the best package to combat ‘Payforit’ scams. However, it has not always been so. Last year, EE would have been the last provider I would have recommended as they had a very high incidence of scams. The situation is likely to change again later this year after the PSA complete a consultation on the rules for subscription services. It seems likely that they will, at least, require other networks to implement the same measures as EE. There are many good reasons for leaving or joining a network, and I would not be unduly swayed by their attitude in this area. More important is to keep careful eye on your account and deal with any ‘Payforit’ scam quickly! If you’ve correctly sent a STOP text you will normally receive a reply confirming that the subscription has been stopped. If you received this, and the charge was made shortly after you sent the STOP message, if could be that the charge was initiated before the STOP was sent. If you didn’t receive the text confirming that the service has been stopped, check that the STOP message has been sent to the correct number. This should be the 5 digit number referred to in the subscription text. This may not be the same number as the text was sent from, so be careful. If you sent the STOP text to the correct number, but didn’t receive the confirmation text, it is probably best to ring the company on the number they provided in their sign up text. In the unlikely event that you continue to be charged after sending a STOP text, this is contrary to both the ‘Payforit’ rules and to the Phone-paid Services Authority Code of Practice. Complain, both to a GiffGaff agent and to the PSA. Keep evidence on your phone of the text messages you have sent and of any messages received. ‘Services’ can be fined heavily for failing to comply with an instruction to STOP.